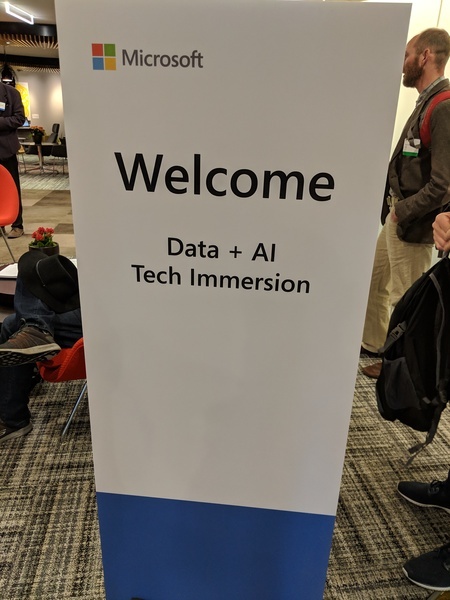 I was invited by Microsoft to attend an analyst and press event in Redmond, WA from 26-27 March 2019, called a Data and AI Tech Immersion. I went to Melbourne airport using a car service PivotNine uses, paid for by PivotNine. I was flying Qantas to LAX, economy class, paid for by Microsoft. I had breakfast in the Qantas lounge—my staple of poached eggs, smoked salmon, and mushrooms—and lingered over a coffee (latte) in the knowledge that I was going to be in the land of terrible coffee for two weeks. Yes, it is possible to get decent coffee in The America, but it’s much harder than Melbourne, and when I say decent I mean in the style I am accustomed to. Americans mostly seem to like a different tasting coffee, and while I (and many fellow Australians, as well as most Europeans) don’t understand it, there are 300-odd million of them, so I’m somewhat outnumbered. 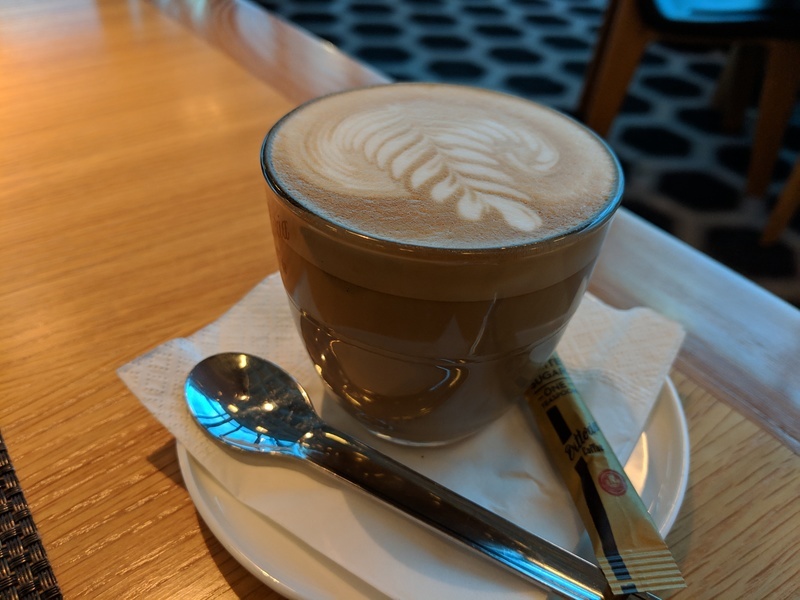 A coffee at the Qantas lounge in Melbourne, Australia. There were other meals on the plane, and then I had second breakfast at LAX after a shower in the Qantas lounge. I had to go the long way to the lounge, via terminal six, because a TSA guard (are they guards? Gatekeeper? Keymaster?) told me the subterranean tunnel between terminals five and six was closed. It wasn’t. I know this because I walked through it to get back to the lounge, and then once again to get back to terminal 6 for my flight to Seattle. I flew to Seattle on Alaska airlines, economy class, again paid for by Microsoft. At Sea-Tac I was met by a car service that Microsoft had organised which took me to the Charter Hotel in downtown Seattle. It’s a very nice hotel, and apparently part of the Hilton chain. I caught up on some email, including having to deal with Australian’s MyGov system internationally. SMS-based two-factor-authentication makes life hard when you’re using a different SIM in a different country, so I did the SIM swap dance to be able to log in despite my perfectly usable Yubikey being right there with me. But yes, let’s absolutely have elections online, that’s a great* idea. Anyhoo, that evening we had a welcome reception at Aerlume restaurant which is extremely fancy. It was a stand-around buffet-of-canapés style affair, and I had a selection of grilled prawns, crab cakes, and various stuff-on-a-toast-square things, all of which were delicious. The standout for me, though, was a dish called Crispy Cauliflower. It was amazing. Cauliflower is usually utterly dull and smells of stale farts, so to be able to turn it into something this good must involve a lot of oil and salt. I had a couple of glasses of quite good Shiraz, which everyone else in the world calls Syrah. I’ll probably keep calling it Syrah until the Americans use a proper date format and SI units for things. Why should they be the only ones who get to be stubborn about silly things? First thing Tuesday morning (7:30am) we caught shuttle buses to the Redmond campus and building 20, which houses the Redmond Reactor conference facility. Breakfast was an American buffet of bain marie bulk scrambled eggs, bacon, sausage, and tureen coffee. 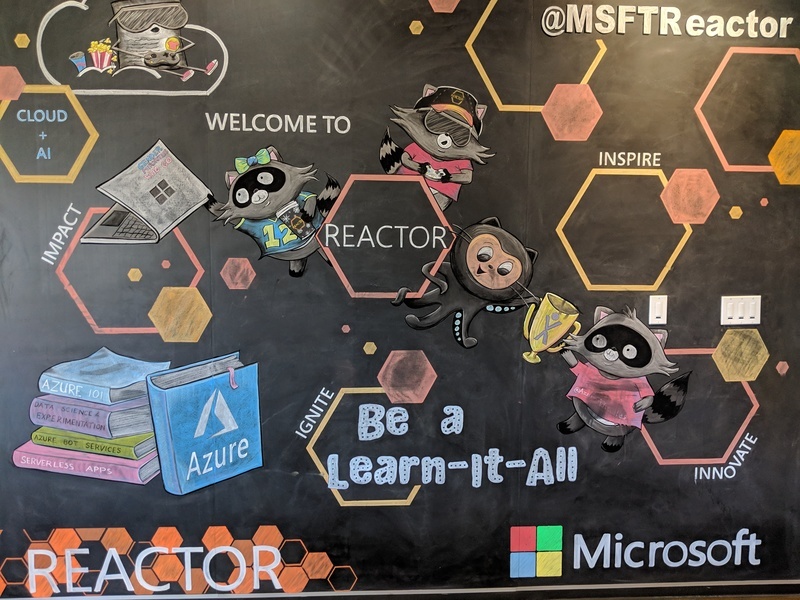 A wall display at the Microsoft Reactor building (Building 20) at Microsoft’s Redmond, WA campus. The facility had multiple fridges full of different kinds of canned drinks (including Dr Pepper and Diet Dr Pepper, huzzah! ), so there was no risk of getting thirsty. At break times, the male-dominated crowd did get to experience what it’s like to be a woman at any theatre venue during intermission due to not-quite-enough urinals and stalls, so one wonders if this was a deliberate design choice. If so, bravo you subversive facilities person you. We then had various presentations by executives, though the ethical implications of data analysis and automated decision making was (metaphor alert!) at the end so we ran out of time to discuss it in detail. After presentations, we got hands-on with some prepared labs using Azure services. Tuesday was all about data and analysis of a more traditional kind, not machine learning, and focused on SQLServer, Azure Cosmos DB, and PowerBI. We moved data from SQLServer into Cosmos DB, set up queries that spanned multiple data sources including Cosmos, SQLServer and CSV files, which was pretty amazing when you think about it in detail, from a traditional relational database perspective. Spanning a query across an RDBMS, a time-series database, and a CSV file is a bit magic, though I expect it to perform far worse than a well-optimised solution designed for a specific use-case. Lunch was catered sandwiches and mini-cupcakes, and a Diet Dr Pepper for me. I tried a machine-made espresso and… it was undrinkable. I don’t think it was the coffee per se but whatever the machine had done to the milk. Either way, I swore off the coffee for the remainder of the event and stuck to the canned drinks. We were taken for a tour of the Microsoft Visitor’s Centre, and given a voucher thing for $200 of purchases at employee pricing. My understanding is that we could purchase things with our own money, but only get charged the Microsoft employee price up to the value of $200, and then regular price above that. It’s non-transferable, and I don’t know that I really need anything made by Microsoft just at the moment. 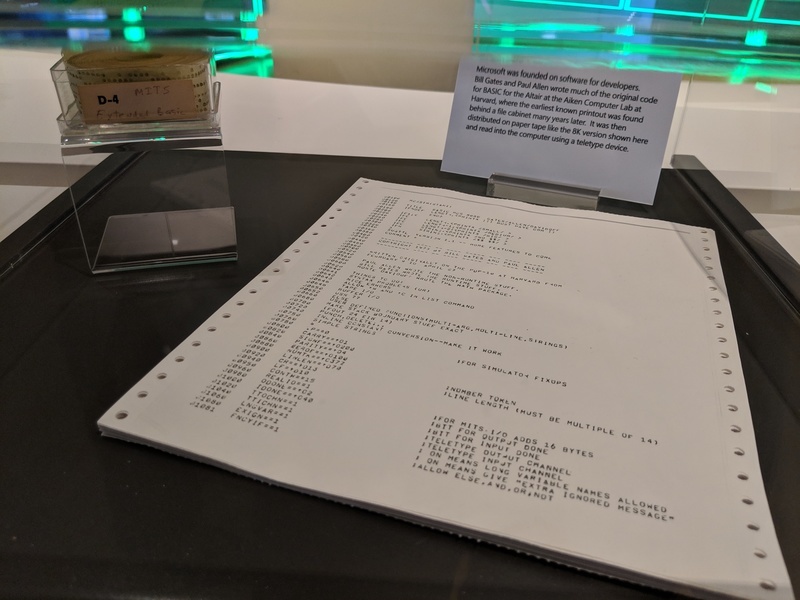 The earliest known printout of MS BASIC, on display at the Microsoft Visitor Center in Redmond, WA. We then had a tour of Microsoft’s hacker space called The Garage, which has a bunch of really cool labs areas that staff can just come and play with if they want. There was a gaming/AR lab with blackened walls and a Tron aesthetic, plus a 3-sided retractable green-screen. All the stuff you’d need to test out augmented reality ideas. There was also a talking-head video production room where you could easily record a piece-to-camera, including autocue capability. There was also a fabulous garage/makerspace room full of sewing machines and 3D printers and soldering irons and all the gear you’d need to physically prototype just about anything at all. We shared a Lyft back to the hotel using a promotion code given to us by Microsoft for this sort of travel during the event. I then caught up with a journalist from The Register at the hotel bar. He has some sort of lethal cocktail while I had a couple of glasses of red wine. We again caught the shuttle to the campus and had the bain marie breakfast, though today there was a kind of whole smoked salmon that was amazing; vastly better than American style bacon. I can see why Seattle has a reputation for good fish. Wednesday was all about AI and machine learning, and we again started the day with presentations from executives before getting stuck into hands-on labs, this time using the various machine learning facilities in Azure. The majority of these labs were Jupyter notebooks, so I was quite glad that I’d taught myself about them a couple of years ago as it made it much easier to follow what was happening. The notebooks were very heavy on the Python, so if you weren’t able to follow what the code was doing, it would all look like a bit of a black box. I was struck by how the Azure ML capabilities are very much aimed at researchers, and not a general business audience in the way that, say, PowerBI is. You really do need to know what logistic regression is, and how the process of using Tensorflow works, to be able to make use of the Azure features we were being shown. That said, researchers are familiar with these tools, and being able to talk directly to Azure infrastructure in a more abstract way means they can spin up the required infrastructure, train a model, and then spin it all down again without having to bother an infrastructure team. That’s quite useful, though it does require a certain amounts of infrastructure-as-resource knowledge so you don’t accidentally spend loads of money testing out something in a naïve way. There is going to be a substantial market for people with Azure tooling skills, aside from the research skills needed to know which algorithms are useful for which problems. 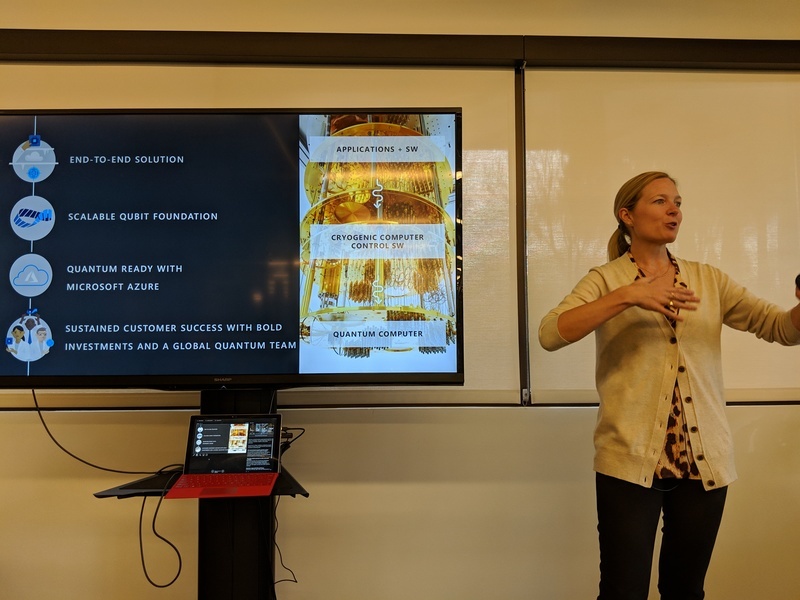 We also had a presentation by Dr Krysta Svore, General Manager of the Microsoft Quantum – Redmond (QuArC) group, about her group’s approach to quantum computing. Dr Svore is a very engaging speaker, and was able to explain things using very simple language and no assumption that you know anything about electron spin or quantum superposition. Her group’s approach does sound promising (and super exciting in a sci-fi nerdy kinda way) but they haven’t actually built a functional qubit using their approach. Yet. Quantum mechanics is deeply weird, but promising for all kinds of specialised computing tasks (it won’t replace general purpose CPUs or GPUs) so I do hope they, or indeed any other team, succeed in building a real-world useful quantum computer. Dr Krysta Svore presents on Microsoft Research’s approach to quantum computing. Between the end of the event and dinner I caught up with a friend from Australia who now works at Microsoft in Seattle, at a brewhouse close to the Redmond campus. Apparently there are lots of these craft brewing places nestled into strip malls in the Seattle area. I had a quite decent local red Ale, while he had IPA, and he generously paid. I then caught a Lyft to dinner, using the promotion code. I assume it worked, but if it doesn’t my company will pay for it. I arrived about 10 minutes early to dinner and had a gin-and-tonic with a few other analysts who were already there, and the venue brought out a cured meats platter of various salamis and prosciuttos and the like. I shared around my Humans: Ruining Everything Since Forever and Designed By Humans stickers, that were well received. Dinner was various small courses, including a quite good rigatoni/gnocchi combination. I had two glassses of Syrah over dinner. After dinner, a decent subset of PR and analysts went across the road to a bar for continued drinks and discussion. I had a Caipiranha, which is a Caipirinha but with tequila instead of cachaça and while they’re a tasty drink, I think they work better when it’s hot. It was a bit cold in Seattle for a refreshing cool drink like a Caipirinha. We walked back to the hotel, which wasn’t far, and I went straight to bed as it was now after midnight. I was up at 7:30am for my 8:30am car to the airport. I wasn’t eligible for the Alaska lounge due to the vagaries of airline alliance regulations, so I just sort of wandered around Seattle airport for an hour-and-a-half until it was time to board the plane to San Francisco. People watching can be kinda fun. The flight was uneventful aside from one small but peculiar detail: after landing, I noticed my bag was a bit wet. I has assumed it rained a bit in Seattle while the bags were getting loaded onto the plane, and didn’t think much more of it, but on BART into San Francisco I noticed a bit of a… fishy smell occasionally. It was just enough to doubt your own senses, so I kindof dismissed it until later that day at my hotel, when I could still smell it. A short bloodhound impression later and I determined that the dampness on my bag was, in fact, a fish-scented dampness. I have no idea how this happened. Perhaps someone had fish oil supplements in their bag, and they somehow got damaged, leaking fish oil over everything? It seems to respond to soap and a rinse in the shower, so hopefully I’ll be able to get the worst of the smell out once I get home and can give the bag a proper clean. The rest of my trip was various meetings in and around the San Francisco Bay area, and covered by PivotNine. My flight back to Australia was paid for by Microsoft, but was yet to happen at time of writing. A Topo Designs Dopp Kit bag. It looks like it’s waterproof/water resistent, so would make a good toiletries bag for travelling. A glassybaby tealight candle holder (with a tealight). A Microsoft-branded USB braided connector cable. It connects a single USB-A connector to USB-C, Thunderbolt, and micro-USB. A Microsoft-branded 6000 mAh Executive Powerbank. It’s circular and silver/brushed aluminium. The up-to-$200-at-staff-pricing voucher for the Microsoft store I mentioned above. Tagged azuredata, hack, microsoft, quantum, seattle, thegarage.